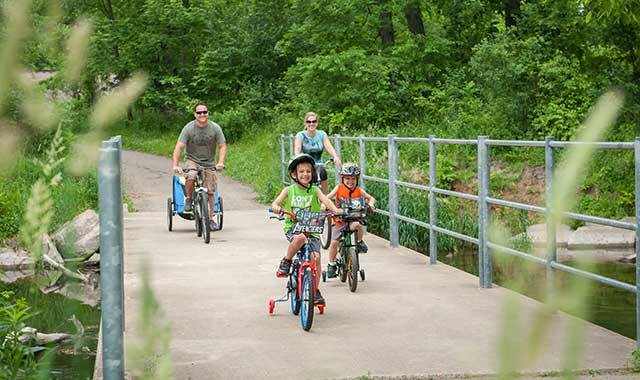 Three major bike trails wind through DeKalb County and its rolling terrain. It’s one of many ways to enjoy the region during the warmer months. Spring has sprung, which means it’s time to break out, take a joy ride and explore some new and unfamiliar destinations. This is a prime time of year to explore DeKalb County, which is filled with popular attractions that can excite the family come rain or shine. For those who want to escape a spring shower, the region’s communities contain unique museums that showcase art, nature and historical exhibits. The Pick Museum’s latest feature exhibit is Quilts and Human Rights, now on display through May 11. Organized by the Michigan State University Museum, this colorful exhibit includes more than 40 quilts centered around themes of social justice honoring champions of human rights. “The Pick Museum staff has added 15 more quilts from the past decade, to highlight the booming modern quilting movement,” says Armstrong. Through the generosity of benefactors, the NIU Art Museum includes a vast collection of 20th century works of art, including prints, drawings and photographs, plus contemporary paintings and sculptures. Its current exhibit, Reclaimed Baggage, depicts how migration and globalization have played a pivotal role in the formation of identity. A trip to the Midwest Museum of Natural History, in Sycamore, is sure to capture the attention of youngsters who have a natural curiosity for animals. This museum’s collection is unique because it’s comprised mostly of mounted animals. Visitors are awed by the mounted African elephant, one of the few on display in the United States. Downstairs, visitors can interact with live animals who make their home at the museum. A new exhibit, Water World, will be on display until the end of August. For those who’d rather venture outdoors, DeKalb County has an expansive system of bike trails within its borders. Three major trail systems wind through the county, the largest of which is the Great Western Trail. It runs between Sycamore and St. Charles. “Riders are able to go from the southern part of DeKalb, through the NIU campus and several parks and forest preserves,” says Armstrong. These same trails and locations are equally enjoyable for passive recreation, such as bird-watching and nature walks. Photographers enjoy their encounters with spectacular wildlife, flowers, trees, and river views amid these open spaces. Are you interested in antiques, treasures, and the thrill of the hunt? Mark your calendars as the City of Sandwich unveils its sixth annual Antiques Sunday at Sandwich. This popular monthly market, filled with quality antiques, collectibles, repurposed items, garden accents and artisan goods, is held the second Sunday of each month from May through October, rain or shine. While in Sandwich, visit the Stone Mill Museum, which is laden with artifacts of this city’s storied history, including the tale of how this community got its tasty name. Craving fresh tomatoes and other veggies? Springtime means the arrival of farmers markets and stands, and the locals flock to places like Theis Farm Market, in Maple Park, and Yaeger’s Farm Market, in DeKalb. The weekly farmers market in Genoa opens in May, while open-air markets in DeKalb, Sandwich, Somonauk and Sycamore open in June. Spring brings renewal and many opportunities to refresh the body, mind, and spirit in DeKalb County. For more information, visit dekalbcountycvb.com. 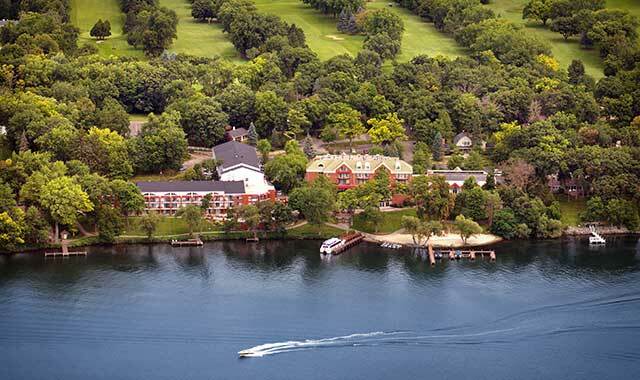 Located on a scenic vantage point at Geneva Lake, The Geneva Inn provides an inviting getaway. Picture a sun-filled spring or summer morning. Maybe there’s a delicious leisurely breakfast, or perhaps there’s a breathtaking lake view. Ideally, you’d have both. If an early Saturday or Sunday morning drive is a favorite quest, head to The Geneva Inn, located on the scenic shores of Geneva Lake, at N2009 S. Lake Shore Dr., Lake Geneva. With an invitation and exclusive offer to “come for breakfast and enjoy a walk on the historic Lake Geneva path,” Len Buonincontro, director of The Geneva Inn, entices guests to visit this spring. The lakeside restaurant is an ideal spot to rejuvenate during the day or wind down at night. By making a reservation for breakfast dining at The Geneva Inn, visitors also receive a special “Shore Path Essentials Kit” to be used for an outdoor adventure after breakfast. The kit includes a Geneva Lake Shore Path Guide map, a bottle of water, a fresh-baked treat made in-house, and a cup of to-go coffee. Visitors can follow breakfast with a shoreline stroll along the 26-mile walking path that goes around Geneva Lake in Walworth County. Walkers will see spectacular million-dollar homes, wildflowers, sculptures and historical markers as they encircle points from Lake Geneva to Williams Bay, Fontana, Linn Pier and Big Foot State Park, all leading back to where the walk began. The Geneva Inn provides spectacular views with first-class service and hospitality. This hidden gem has a rich history dating back to the early 1850s. A.H. Button and his family settled in Lake Geneva to build Gypsy Lodge, the city’s first summer residence and large estate. It continually evolved over the decades to become The Shore Club and Buttons Bay. In 1989, the 105-year old home was razed. In 1990, The Geneva Inn was built at this location and today it’s regarded as one of the most beautiful places in the Midwest, Buonincontro says. It offers luxury rooms with scenic lake views, a venue suitable for weddings and a gathering place for meetings. Whether guests desire a casual breakfast or lunch, or an intimate dinner and evening out, The Geneva Inn offers a myriad of award-winning, mouthwatering dining selections. Guests can enjoy happy hour daily from 4-6 p.m. in the bar and lounge area. For more information on The Geneva Inn, call (262) 248-5680 or visit genevainn.com. Heidel House’s location on the shores of Green Lake, in Wisconsin, puts it in an optimal location for recreation, dining and relaxing – and, of course, exploring the city of Green Lake. In 1945, Herb and Lucille Heidel purchased a 12-acre spot along Green Lake known as the Kelly Estate for $20,000. That beautiful lakeside land served as their home, where they enjoyed entertaining guests. Their reputation spread, and by the 1970s, their family-run retreat had grown into a popular destination. Today, this hidden gem is still entertaining guests as the Heidel House Resort & Spa. Heidel House’s manor, which dates back to 1890, is nestled along the shores of Green Lake in the appropriately named Green Lake, Wis., just four hours northwest of Chicago. Heidel House now serves as a full-service resort that offers everything from boating and fine dining to golf and tranquil retreats at Evensong Spa. For those looking for an extended weekend (or longer) to get away, Heidel House offers endless ways to relax or be active. Find jet ski and boat rentals from the dock, tennis courts on the property, and entertaining cruises on the Escapade yacht. And for those who want to venture out a little farther, there are many options within a 15-minute drive, including the renowned Golf Courses of Lawsonia and the Tuscumbia Country Club, a local winery, and miles of area bike trails. Grey Rock: Featuring floor-to-ceiling windows that look out over Green Lake, Grey Rock is a feast for both the eyes and the stomach. Located in the lower level of the on-site Grey Rock Mansion, which was built in 1949, the dining room is adorned with the building’s original bookshelves and mirrors. The menu boasts classic dishes prepared with local ingredients, from steaks to seafood to vegetarian cuisine. On Saturdays, from 7-10 p.m., piano music serenades diners. The Sunroom: Like Grey Rock, Sunroom provides a picturesque lake view for those who want to enjoy a casual breakfast or lunch. The menu ranges from lighter fare to more hearty meals. Diners can start their day with a hot cup of Columbian coffee and enjoy anything from eggs and pancakes to breakfast nachos. As for lunch, the menu carries a wide variety of appetizers, soups and salads. Boathouse Pub: Decorated in a nautical theme, Boathouse Pub fits those who just want a simple burger and a beer. Pump House Parlor: After a meal in any one of the three main restaurants, the Pump House Parlor caps things off with a couple scoops of Sassy Cow ice cream. In-room dining: For those who want to keep their dining experience even more intimate, Heidel House offers room service daily until 9 p.m., featuring anything from breakfast and full meals to late-night snacks and desserts. For more information on the Heidel House, visit heidelhouse.com. 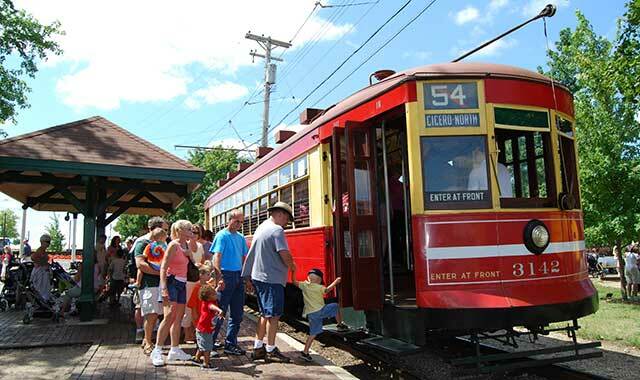 The Illinois Railway Museum, in Union, celebrates the state’s bicentennial with rides on steam, diesel and electric trains, including the trolley. Spring signals a time to get out and get away, and McHenry County has plenty to offer for both day trips and weekend adventures. For outdoors enthusiasts, there are myriad opportunities. Bicyclists can enjoy the 26-mile Prairie Trail, which begins just south of Algonquin and runs through eight communities on its way to the Wisconsin state line. The path travels across farms, prairies, forests and parks. It also hugs the Fox River at points and cuts through the expansive Glacial Park conservation area. For those who prefer two feet to two wheels, Moraine Hills State Park, near McHenry, has more than 10 miles of trails where hikers can see rare plants and migratory waterfowl. The Fox River borders Moraine Hills on the west, and the 48-acre Lake Defiance rests right in the middle. system encompasses 6,500 acres of water and 488 miles of shoreline – a real haven for boaters, water skiers and fishermen. For a quieter experience, Three Oaks Recreation Area, in Crystal Lake, sits upon a former quarry that’s been repurposed into two lakes with a picnic area, playground, hiking trails, wakeboard park and marina with rowboat, canoe, kayak, sailboat and paddleboat rentals available. Popular outdoor events in McHenry County include the weekly farmers markets, most of which begin in May. They take place in Cary, Crystal Lake, Huntley, McHenry and Woodstock, where vendors offer fresh seasonal produce, baked goods and crafts. For days and hours of the markets, go to VisitMcHenryCounty.com. One of the great destinations in McHenry County is the Illinois Railway Museum, the largest railway museum in the nation. Illinois Day, which celebrates the state’s bicentennial, is May 5, and all Illinois residents will be admitted at half price. Steam, diesel and electric trains will also operate during Memorial Day Weekend, with active military personnel and their families admitted free. If you’re looking for one-day events throughout the county, there are plenty. Find a full list at visitmchenrycounty.com. The Glacial Park Team Challenge, a non-competitive recreational triathlon, will be held in Richmond on May 19. Participants bike 14 miles, hike/run five miles, and paddle seven miles. Registration deadline is May 7. Food & Wine Pairing Classes at Loyola University Retreat & Ecology Campus, in Woodstock, are popular throughout the year. Two professional chef-instructed classes are on the docket this spring, starting with the Vegetarian Wine Dinner April 28. It begins with a wine reception and appetizers, followed by a totally vegetarian five-course dinner. On May 11, the Champagne & Sparkling Wines class features a champagne reception with appetizers that leads to a five-course dinner paired with champagne and sparkling wines from around the world. Spring in McHenry County offers a smorgasbord of opportunities. To learn more about events, lodging and dining, go to visitmchenrycounty.com, or call (815) 893-6280. Tour the 18 canyons at Starved Rock State Park, in Utica, Ill., and take in the colorful sights of spring’s blossoms. Springtime is perhaps the best time to see why Starved Rock Lodge is such a popular place to visit. The only hotel within scenic Starved Rock State Park, in Utica, Ill., is less than 90 minutes from Rockford and the Chicago suburbs, and it’s an ideal starting point for your springtime adventures. Waterfalls come to life and wildflowers begin to bloom as spring arrives. The Virginia Bluebells in Illinois Canyon, coming in late April, are the highlight of Mother Nature’s handiwork. Throughout April and May, Waterfall and Canyon Tours are offered on Mondays and Saturdays. 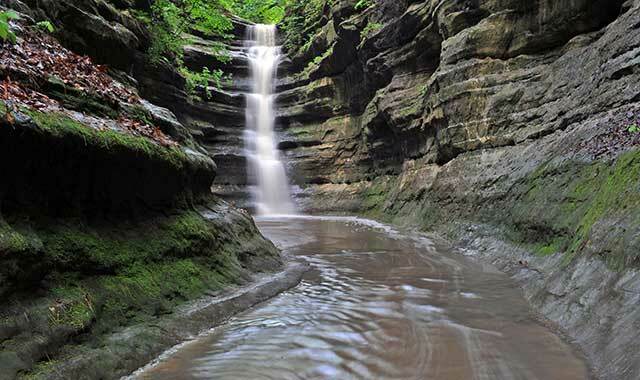 The tour includes a ride on a Starved Rock Trolley and guided hike to French, St. Louis and Ottawa Canyons. Details and departure times are listed on the Lodge’s website. Starved Rock now attracts more than 3 million people each year. Visit for a midweek getaway and enjoy the beauty of this natural wonder with fewer crowds. Spend the night at the Lodge and find a variety of overnight packages. First-time visitors are encouraged to register for the “First Course Tour” on Wednesdays to learn about the rich history of the Lodge and its surrounding parkland. Tickets are $20 per person and include the tour, a beverage from a special drink menu and an appetizer sampler plate. Guided hikes are offered each weekend along with historic Trolley Tours. Music lovers enjoy the “Tribute to the Stars” shows, which include a buffet lunch in the Great Hall. Shows are scheduled throughout the year. The Main Dining Room is open daily for breakfast, lunch and dinner. Sunday Brunch is a crowd pleaser, so make your reservations in advance. Live music makes the Back Door Lounge a fun place to be on Friday nights from 8 to 11 p.m. Gorgonzola Nachos and Signature Ale are among the most popular choices on the menu. From Memorial Day through Labor Day, the party continues just outside on the Veranda, where the scenic views can’t be beat. Lunch and dinner are served on the Veranda once it’s warm out. If you’d like to adopt a new BFF, don’t miss Woofstock, a pet adoption festival, on May 20. Not only can you find dogs in need of a forever home, but you can bring your own dog to join in the pet parade at 10 a.m. and learn about how to care for your pup from experts who will lead educational seminars. To learn more about Starved Rock Lodge’s spring happenings, visit starvedrocklodge.com. This entry was posted on Tuesday, May 1st, 2018 at 11:58 am	and is filed under Recreation & Destinations. You can follow any responses to this entry through the RSS 2.0 feed. Both comments and pings are currently closed.